Following on from last week's Friday Fashion post, this week I decided to do a 'How to Wear' for the 70s trend! This has been popular since last A/W, and is definitely carrying on through spring. There are definitely some key items that you can add to your wardrobe if you want to try the trend yourself, so you can channel the trend as subtly or boldly as you like! The Knee High Boots - Knee high boots have definitely had a bit of a moment, and they are the perfect transitional shoes as we go into spring. To really channel the 70s trend, make sure they're suede/faux suede as suede is key to this trend. I have a post coming very soon on how to style knee high boots so look out for that soon! I got mine from Zara, but some other great places that do lots of styles are Missguided, In The Style, Public Desire and River Island. The Suede A-Line Skirt - The a-line skirt is such a flattering style, and perfect for trying out the 70s trend. Go for autumnal colours, such as tan, burgundy, navy or black. ASOS have a great selection such as this navy Whistles skirt, ASOS brown skirt, or this mustard Monki skirt. For something a bit cheaper, this tan New Look skirt is gorgeous and less than £15, or Missguided have a gorgeous button up tan skirt, and this teal green skirt is gorgeous and great for a pop of colour. The Pinafore Dress - Adding some cuteness into the trend, the pinafore dress is perfect for layering - add it over a white shirt or turtleneck, and pair with knee high boots for a gorgeous 70s look. Keep it from looking too 'school girl' by wearing it in a denim or suede fabric. This Missguided denim one is perfect for this look, or this ASOS one with patch pockets is gorgeous. If you aren't a fan of wearing colour, go for a black denim, like this ASOS one. New Look also have plenty of budget friendly pinafore dresses. The Floppy Hat - I feel like the floppy hat is such a classic 70s piece. Personally, I'm still trying to find my perfect one (or maybe hats just really don't suit me!). This ASOS burgundy one is lovely, or grab a bargain with this black New Look one for less than £10! 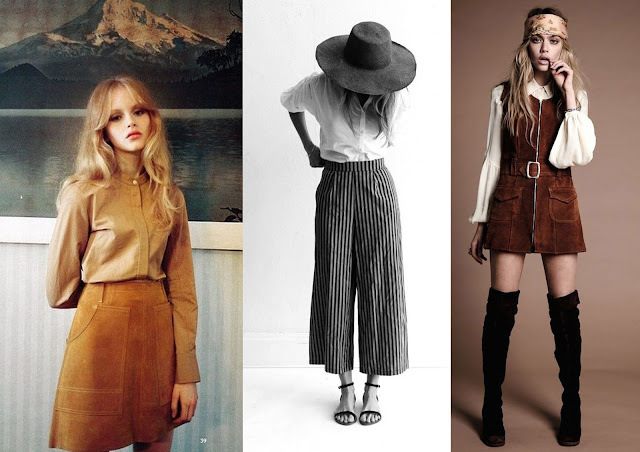 So what do you think of the 70s trend? Are there any other key pieces you think perfect the 70s look? Let me know in the comments!